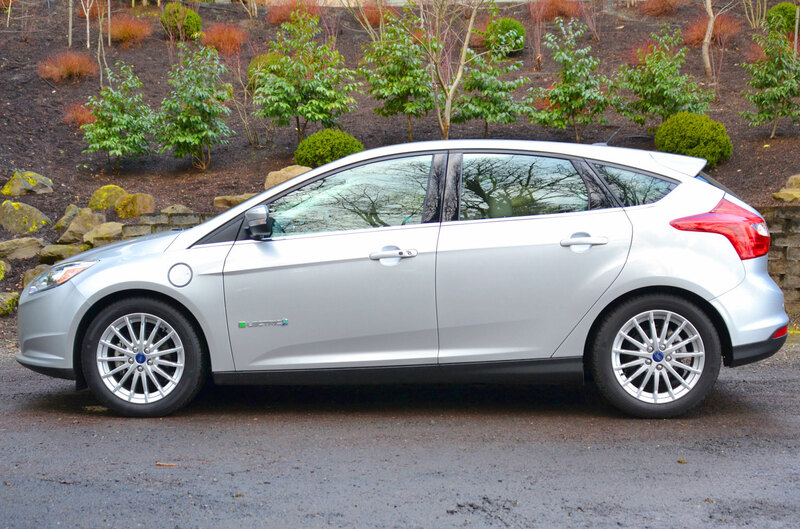 The Focus Electric – as its name implies – is Ford’s first full production, all-electric vehicle. Up until recently, it was slim pickings for EV adopters, with the Nissan Leaf and Mitsubishi i the only real option south of $50,000. That’s no longer the case. Ford has been very keen to tout its EV chops with a sophisticated EV that eschews more eccentric styling found on the Nissan Leaf and Mitsubishi i, and instead dons the sleek suit of the third-generation Focus. We recently dived into the Focus Electric to find out whether this incognito EV is more style than substance, or if it has the ability to electrocute the competition. 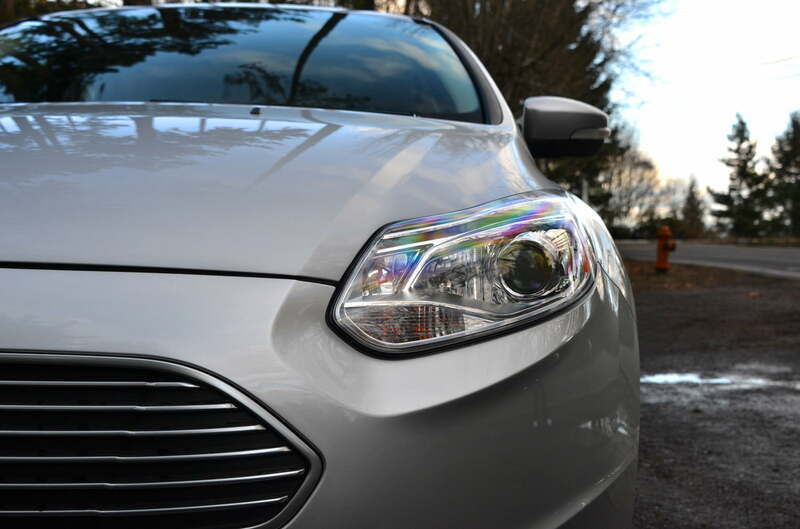 The Focus Electric’s is just as handsome on inside as it is on the outside. Material quality is top-notch with an aggressively sculpted dash. And the “Starship Enterprise” styled center console will have drivers barking commands to passengers like a modern day Picard. Cloth bucket seats (partially made from recycled materials like plastic bottles) come standard, although leather interior can be had for $995. A few design choices ding the overall layout, as do the omission of a few creature comforts. The interior is dramatic, but taller passengers will dislike the way the dash dips too closely, swallowing up more space that it should. 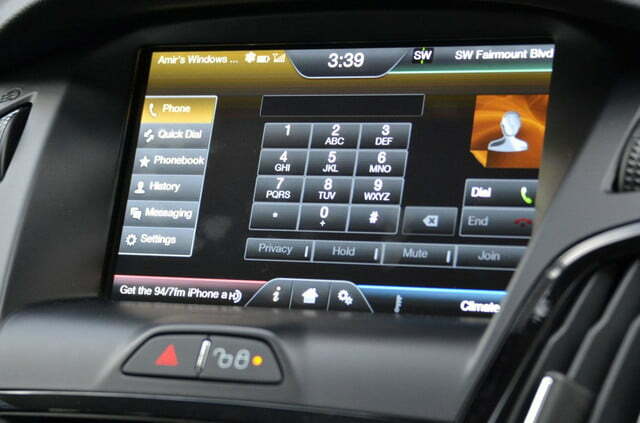 The touchscreen is elevated a little too much, making it difficult to reach while driving. 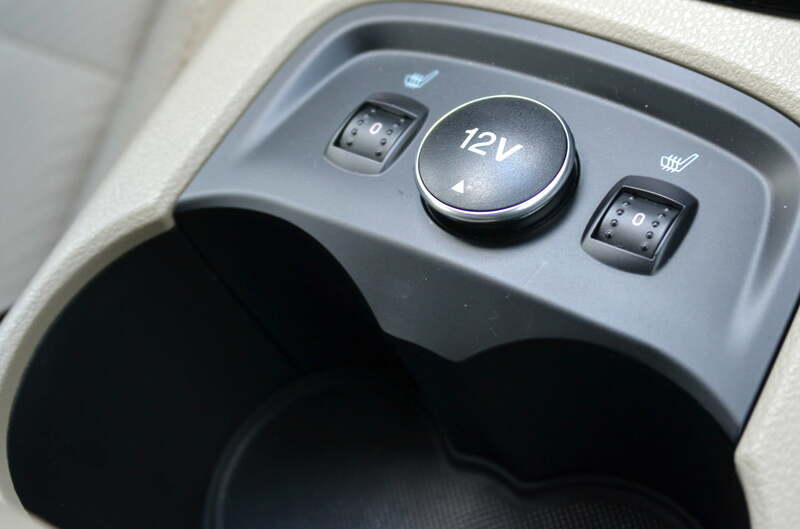 Up front, there are no adjustable power seat options for passenger and driver – although both are heated which is a welcome addition. 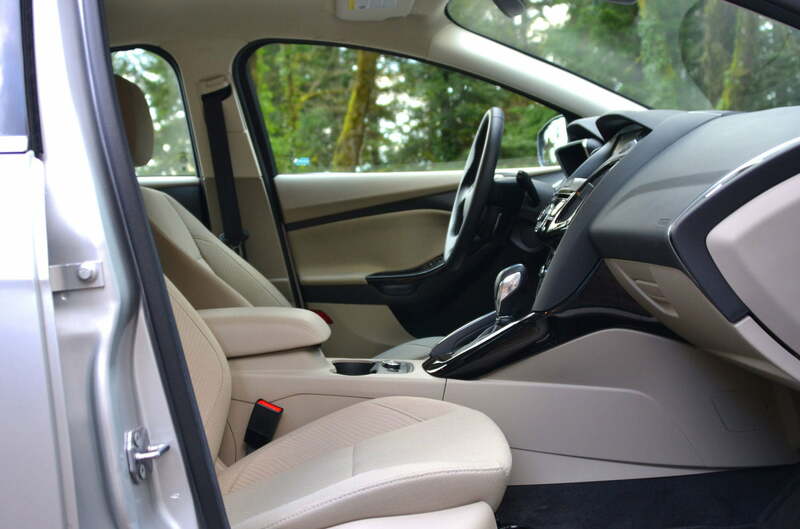 In the back, the Focus Electric is moderately spacious, and despite the fact that Ford says it will fit three people in the rear seat, two is much more realistic. While head and shoulder room is decent, leg room is a little less generous. 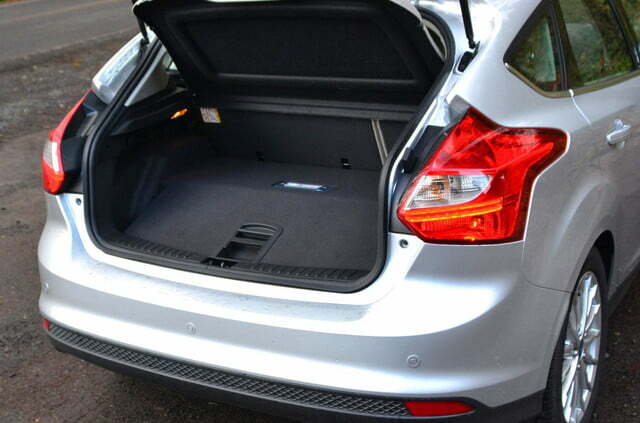 Due to the Focus’ large electric powertrain components located at the rear of the vehicle, cargo room suffers, with only 14.5 cubic feet on offer – a far cry from the 23.8 cubes available in the standard Focus hatch. A hidden compartment underneath adds 1.5 cb.ft of space. Much of the attention surrounding the Focus Electric will center on its battery-based powertrain. However, Ford’s EV-in-disguise is packing quite the tech suite on the inside, too. 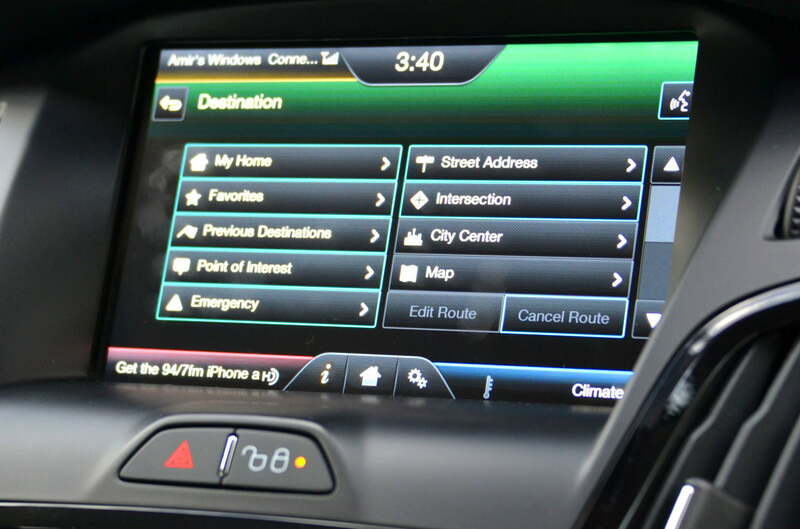 At the heart of it all is the latest version of MyFordTouch, which serves as the hub for all the vehicles audio functions, climate controls, Bluetooth phone connectivity, and navigation features. The Focus Electric comes with Sony’s premium nine-speaker sound system (one of the best we’ve listened to at this price point) HD Radio, SiriusXM, and a single-disc CD player. 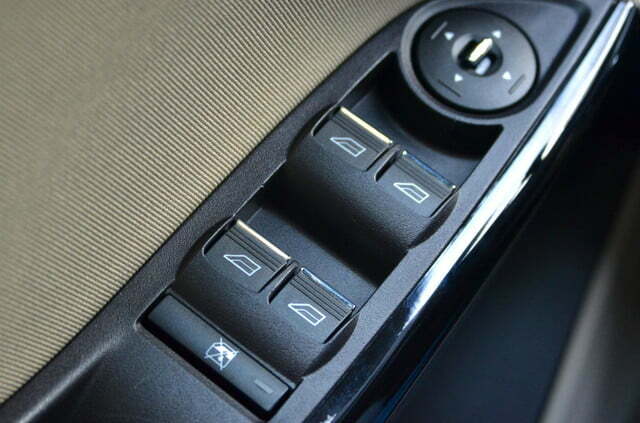 More contemporary audio options include two USB ports located in the center console for iPod/smartphone hookup, and Bluetooth wireless audio streaming. On paper it all sounds great, but Ford’s system has been poorly received for some time now. 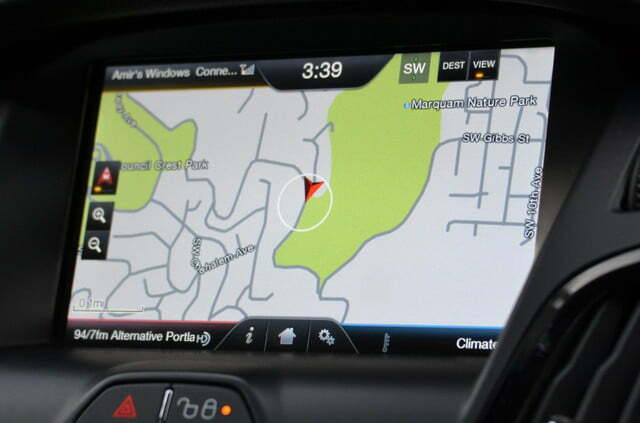 And despite the Blue Oval’s attempts at patching MyFord Touch with updates, it’s still as sluggish as ever. While the onboard electronics are masked behind pretty color-coded touchscreens, LED displays and some smart design choices (gotta love those two USB ports in the center console), many of the onboard tech features are sluggish and downright frustrating. Let’s start with something as simple as Bluetooth pairing. In most vehicles, one must simply activate Bluetooth on their phone and find the corresponding menu option in the head unit. The Focus EV is no different in this regard and gladly lets you pair your device while the vehicle is moving (a rarity). The problem here is that you’re required to enter a complex string of numbers whenever pairing a new device. While we don’t (necessarily) mind inputting a simple string, such as 0000, inputting a complex combination such as 0746 is silly, not to mention distracting while driving. But it doesn’t end there: Streaming audio and using hands-free calling is a chore, and performed inadequately during our week-long evaluation. We suffered frequent dropped calls in areas of maximum reception. Streaming music from apps like Pandora/Spotifycaused the phone to lose its Bluetooth connection when changing tracks. And the music stored locally on our phone didn’t fare any better, losing connection when changing tracks through voice, touchscreen, and on the device itself. Physically cabling our devices and streaming music locally seemed to work better, but with MyFord Touch, the system performing without any hiccups was always the exception – not the norm. Other frustrations include an unresponsive touchscreen, small icons (particularly frustrating when using the nav system), and a convoluted menu array that, despite being broken up into easily distinguishable color sectors, requires a steep learning curve (and the patience of saint) to overcome. It’s not all doom and gloom though; voice recognition is surprisingly proficient. Placing calls is easy as stating the contacts name, and the system can even read incoming text messages aloud, which you can then dictate a response to or simply ignore. A handy “do not disturb” icon on the touchscreen also lets you turn this feature off entirely. 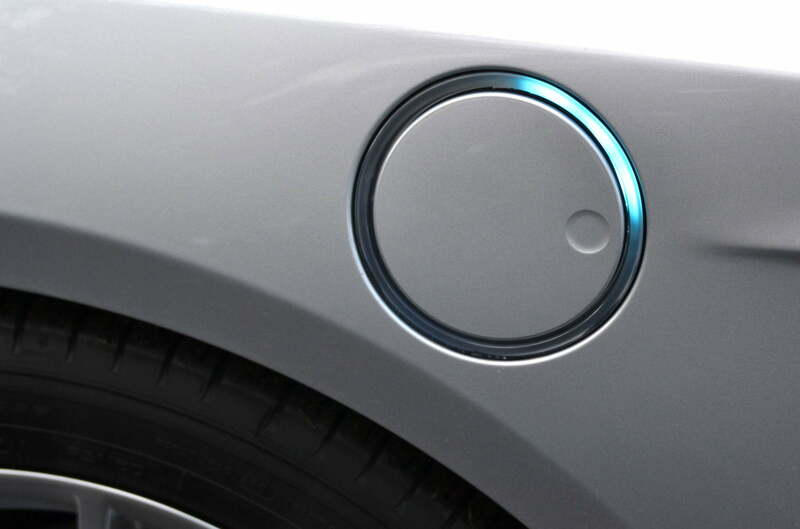 MyFord Touch also makes it easy to find the nearest charging station, which should help alleviate range anxiety for those driving around town. 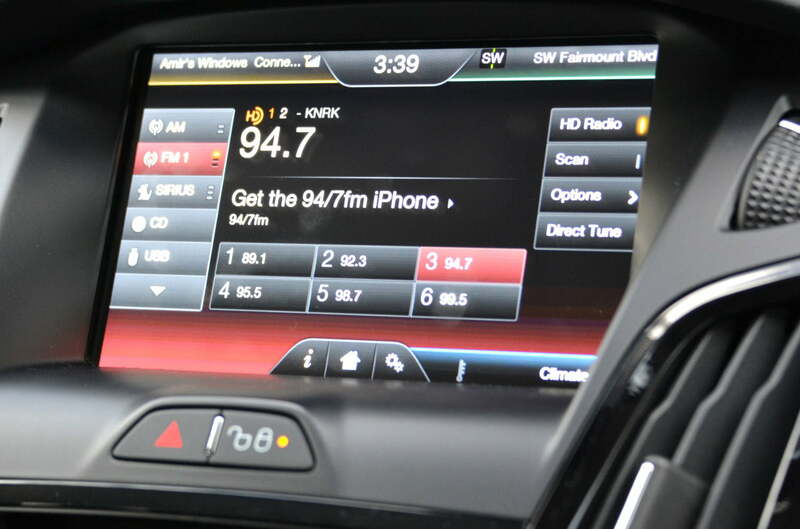 Like other Ford vehicles, the Focus Electric offers AppLink, which gives you voice control over certain compatible apps. This list is constantly growing with Pandora, USA today, and The Wall Street Journal among some of the more notable ones. Rounding out the Focus Electric’s tech suite is a rearview camera with trajectory lines and multiple sensors placed at the rear bumper. 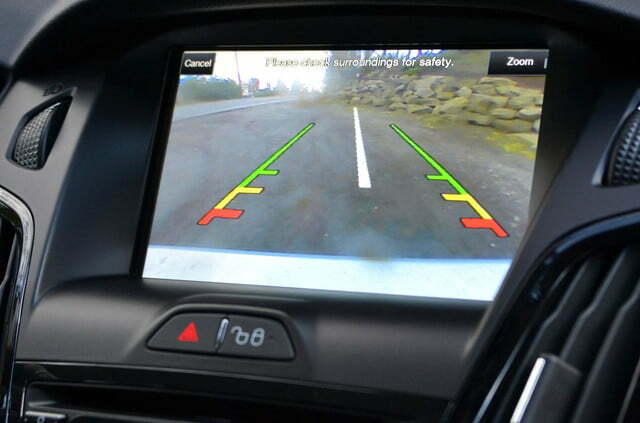 Approach an object and an audible warning will beep more rapidly the closer you get. Not everyone appreciates the eccentric (but aerodynamically necessary) style of today’s EVs. The Nissan Leaf and Mitsubishi i are prime examples of “out there” electrics, however, Ford has taken a more subtle approach and based its car on the remarkably attractive gasoline-powered Focus. The Focus Electric isn’t for the ostentatious EV adopter, and if you’re looking for a car to make a statement, this one isn’t for you. Apart from the Aston Martin-like front grille, electric badging on the doors/rear end, lack of a tailpipe, and a charging port on the front left fender, you’ll have trouble telling a gasoline-powered Focus from its electron-guzzling counterpart. Forgoing gasoline altogether, the Focus Electric is powered by a 23-kilowatt-hour lithium-ion battery pack. Power is sent to the front wheels via a 107-kilowatt (143-horsepower) electric motor and mated to a single-speed direct-drive transmission. For comparison, the Focus Electric’s main competitor, the Nissan Leaf, has an 80-kW motor and a 24kWh battery with similar front-wheel drive setup. 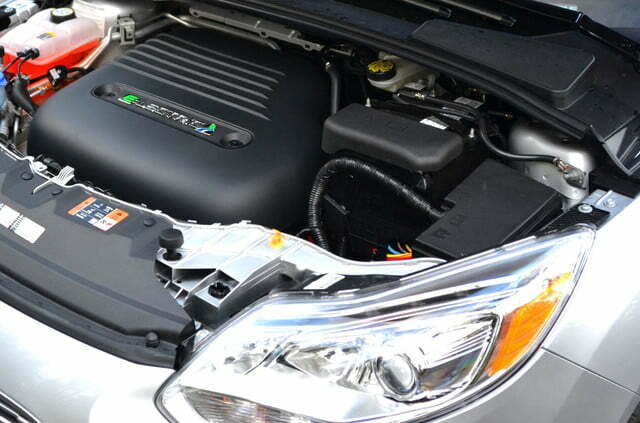 However, because the Focus features a liquid-cooled battery packed, opposed to the air-cooled variety found in the Leaf, drivers should find it more resilient in extreme temperatures, which has plagued Leaf owners in states like Arizona. EPA figures place the Focus’ range at 76 miles and 105 MPGe. While those figures don’t blow away the Leaf’s 73 mile range and 99 MPGe EPA rating, the Focus Electric is the clear winner here. Of course MPGe can be a tricky number to understand, but it’s essentially the distance an EV can travel based on the amount of energy in a single gallon of gas. For more info, click here for our extensive write-up explaining MPGe. We’d like to point out though that these figures are based on the 2012 model year Leaf, and Nissan expects these numbers to increase for 2013 with a number of changes made to improve aerodynamics, more efficient onboard electronics (climate control being one of them), regenerative braking, and a reduced drag coefficient. 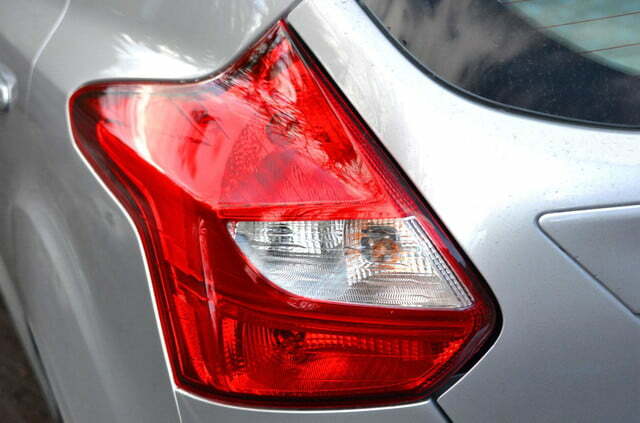 Official EPA figures have yet to release for the 2013 Leaf but we’ll l update this when it does. The Focus Electric can be a little intimidating at first, especially if you’ve never been inside an EV. David Treharne, technical leader of electrification systems and controls, told us that the car actually “learns” how you drive. It can average your previous vehicle mileage and driving habits, and then spits out range information based on the data collected by its onboard computers. Sadly, the way the range is displayed and the multitude of numbers (positives and negatives) thrown your way can make it feel like you’re front and center in an old college calculus class, rather than you are behind the wheel of an electron-powered vehicle – thankfully there was no pop-quiz at the end of our drives. As it turns out, though, the Focus Electric does a good job of coaching you into being a more efficient driver. 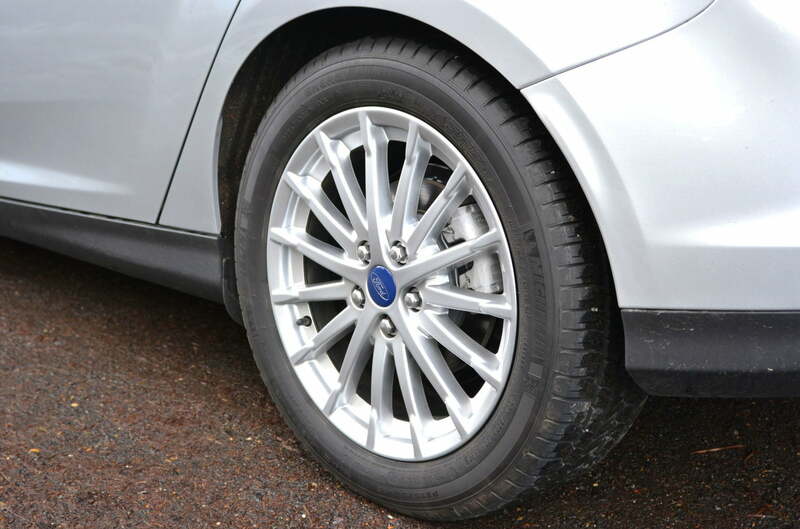 There is a helpful regenerative braking feature than can add a few miles to your range, and the brake coach shows you a percentage after every complete stop of how much energy you’ve recaptured. Unlike gasoline engines, which thrive in open-road environments, EVs are at their most efficient in the city and around the suburbs. Driving on the freeway will drastically reduce range, especially when factoring in power-sapping features like climate control (a huge drain) and other onboard electrics such as navigation, radio, Bluetooth streaming, etc. And range is a concern, which is one of the reasons why many have been so slow to adopt EVs. With a gasoline-powered car you simply jump in and go. But the Focus Electric, like all EVs, save for maybe the Tesla Model S, requires that you plan ahead; to know where you are going and what the context of that drive will be. Many drivers will find this compromise too much to bear, especially in colder climates where something as banal as defrosting your windows can mean the difference between making your trip and running out of juice. We tried maximizing our range by forgoing such pleasantries, but on some mornings we simply had no choice. Of course, range anxiety is less of an issue if you have access to a charger in your home or place of work. However, not everyone will have these available. To be fair, this isn’t just a problem for the Focus Electric, but EVs as a whole, which further limits their mass appeal and practicality. Fast charging speeds and a robust infrastructure just aren’t there yet. Charging is one of the things the Focus EV does do well. Drivers can set up charging schedules for off-peak hours. 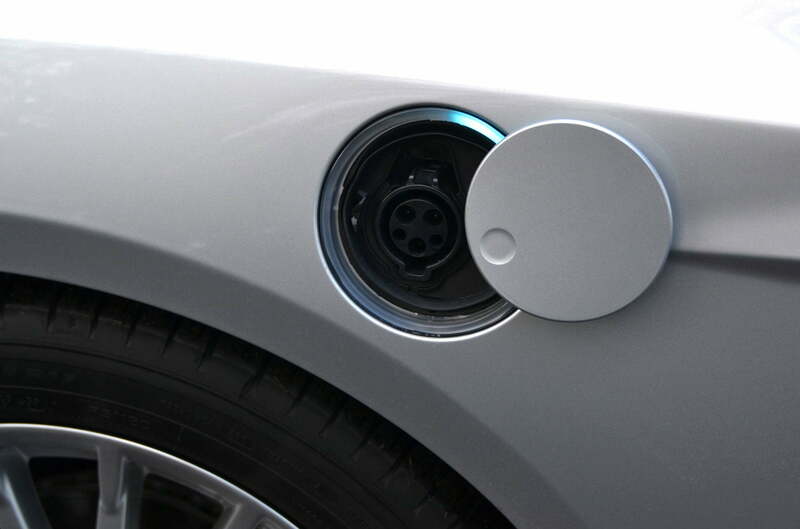 Using a 240-volt, Level 2 charging station will zap you back onto the road in about four hours, while a more primitive 120-volt charger will take roughly 20 hours. The Focus Electric does not support a 30-minute DC quick charge, so impatient types have been warned. Off the line the Focus Electric isn’t as pleasurable to pilot as it could be. Because there are no gear changes, the car delivers instant torque right off the bat. The problem here, however, is Ford engineers seem to have purposely programmed take-off power to be less responsive than what the car is actually capable of. We imagine this was done to conserve battery power, but it’s disappointing to say the least that one of the true joys of EV driving has been stripped down so noticeably. The electric zest that remains is primarily felt at low speeds, and once in motion – say on the freeway – the Focus loses a lot of its pep. Drivers need not worry though, as it’s more than capable of quick lane changes and freeway merging. The car’s onboard battery and components don’t do it any favors when it comes to handling, and is one of the areas we think the Nissan Leaf bests its battery-powered nemesis. Because the Focus Electric is virtually identical to the standard Focus, Ford’s engineers had no choice but to stuff its batteries where they fit, meaning much of the Focus’ added weight (it weighs a total of 3,624 lbs and is 700 lbs heavier than the gasoline version) is jutted out to the corners, which in turn hinders the vehicle’s handling chops. So while Focus Electric drivers may fly under the radar, the tradeoff is a car that is a little less efficient with stilted handling. 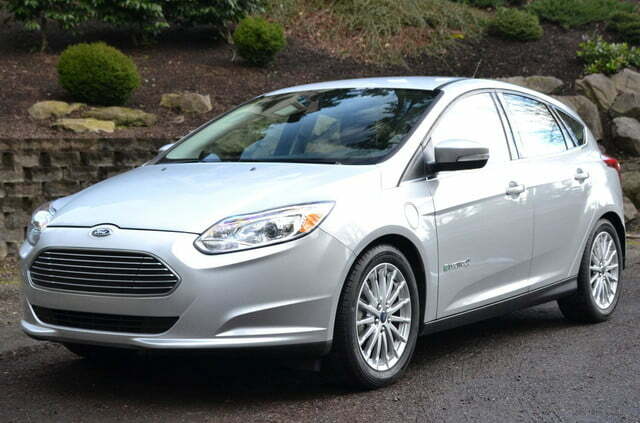 Overall, the Focus Electric is as polarizing as the powertrain that pushes it. On the one hand we have a very handsome and comfortable incognito EV that won’t stand out at a stoplight but still does its part in saving the environment. 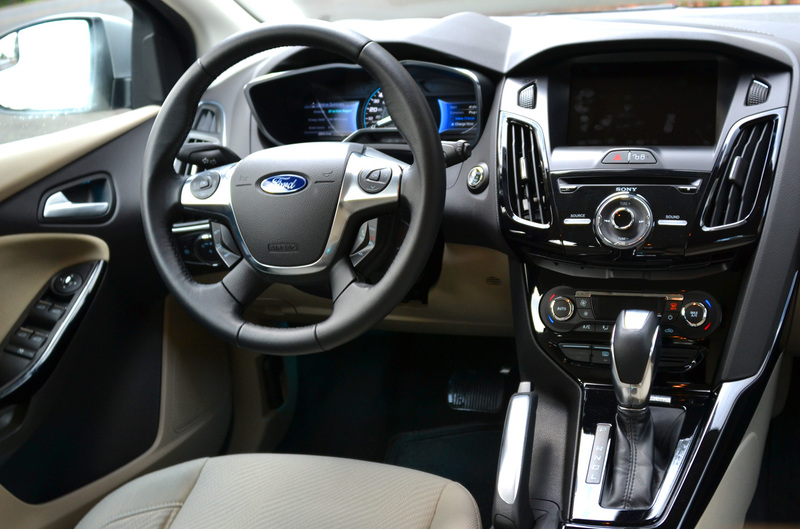 On the other we have a heavy car that doesn’t perform as well as we’d like and sports an excruciatingly buggy infotainment experience courtesy of MyFord Touch. Top that off with a $39,995 (buyers may also be eligible for a $7,500 Federal tax credit) sticker price for a car that can travel less than 100 miles on a single charge and limited availability, and potential customers have a lot to think about. At this point, it’s clear that driving an EV isn’t anywhere near the level of convenience it needs to be for mass adoption, nor is the technology at the point where it can replace ICE cars. What will drive early adopters are the enviro/political factors more than anything else, and it is for those two reasons we recommend the Focus Electric. However, if you require a little more versatility from your vehicle but still want a taste of EV technology, we recommend you go the plug-in hybrid route instead and take a look at the Chevrolet Volt.